I was asked recently what I pack when I travel. I was probably on the road for about 3 months last year and 138,000 miles so I do have some experience. Here is what is in my bag. As a rule, I pack for no more than 10 days. If I am on the road for longer than that I plan on doing some laundry just like I do at home. This might mean washing some things out in a sink or it might mean laundry in a hotel or a launderette. On rare occasion, when I am someplace that is inexpensive it might mean a laundry service. But I find the inconvenience of a little washing is made up for in the extra mobility that packing light gives me. My backpack itself is a Pacsafe Ultimatesafe 22L anti-theft backpack. I did some work for PacSafe last year. I don’t use all the gear they gave me, but I really have liked this backpack. It is smaller than my old one but big enough for what I carry. The anti-theft part of the backpack doesn’t hurt either. MacBook Air – I never go anywhere without my MacBook Air which I use to work on the road both as a software developer / entrepreneur as well as a blogger and podcaster. I love how a machine this powerful is also so darn light an once you have gone to a solid state drive you will never go back. iPad Mini – When I am done working for the day I often switch to my iPad Mini which has video, eBooks, games and more on it. I still have the 1st version but my wife just got the 4th edition. I will upgrade when mine stops working great. See Best iOS Apps Ever – What I have on my iPhone and iPad for more info. Belkin SurgePlus – compact power strip that will make you friends in the airport when outlets are scarce. 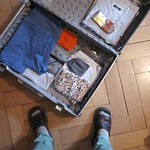 My suitcase itself is a Pacsafe Toursafe Lifestyle 21 Inch, another great bonus from the work with PacSafe. A larger suitcase will fit in an overhead bin but both American Airlines and United at SFO have been restricting carry-on suitcases to the 9″ depth of a bag like this. Sometimes for longer trips I will use a American Tourister Luggage Splash 21″ Upright Suitcase, which claims to be not as deep but lies. My Pacsafe bag is green and the American Tourister is red, but I still have a ribbon or something so they can be spotted on a luggage carousel if I have to gate check. My wife has started using the 4 wheeled carry-on bag from Away which I got from them. A 4 wheel bag maneuvers better on the plane itself (sideways), but can also roll away on its own sometimes. This one, in addition to being a great hardshell case, has a built in battery that you can charge so that you can recharge your device at the gate when there are no outlets available. (For $20 off your order, visit awaytravel.com/traveler and use the promo code traveler during checkout.) She also uses packing cubes although I do not. Blue jeans – They dry slowly so they are not ideal for travel, but I still like jeans. On trips to warm climates where shorts are not culturally acceptable I replace my jeans with lightweight travel pants. Pickpocket proof pants – These pants are dressier than jeans, dry better and the pockets have zippers and buttons to discourage pickpockets. cotton boxer underwear – These are easy to wash and dry overnight. I have a pair of exofficio briefs that backpackers swear by, but they are more expensive. hat – I have what looks most like a foldable cotton cowboy hat (see Amateur Traveler home page), with a brim for good shade, although have switched recently to a more compact baseball style cap. iPhone 8. See Best iOS Apps Ever – What I have on my iPhone and iPad for more info. I have T-Mobile One Plus International because it has the best data roaming (free) for travelers.